“The reason I became involved in horticulture was through years of doing my own garden as well as helping my Mum and Dad with theirs when I was living at home – my Dad claims to grow the best spuds in Surrey! I always loved being outdoors in any weather, I’ve always been an outdoor person, so it seemed right for me to change from a career that had run its course for me personally (eleven years in the print industry) and study horticulture at college first, before changing jobs and gaining experience in the practical side of horticulture. I studied for 3 years doing RHS certificates before going to work in Kensington. The worst part of the job was picking up dog mess, emptying bins and picking up other people’s rubbish. If the weather was nice and hot, that is all you did all day for 14 hours. This was when I knew I was leaving no matter what. I saw the ad for the traineeship at Chelsea Physic Gardens at this time and applied, praying to get the job. After a successful interview and getting the call from the Head Gardener to say I had the job a few weeks later, I knew I was going to get the right training by well-trained and experienced staff. The year went quickly and during that time the glasshouse manager left, leaving the position vacant for myself and the other trainee. We both applied for the job and I was the lucky one who got it and started my new role in September of last year. 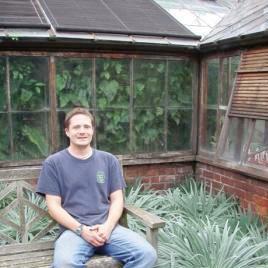 The HBGBS traineeship is a great way to learn such varied skills and to meet new people from all walks of horticulture. Everybody has their own ideas of where the knowledge gained over that year will take them. Quite a few people I know from that year on the HBGBS traineeship have gone on to great new jobs here in the UK and also abroad. The training days are good fun and you’ll be amazed at what you don’t know! The best part for me over the year was to know that the training was helping me to gain knowledge and confidence that in the end would secure me a great job in a wonderful garden.